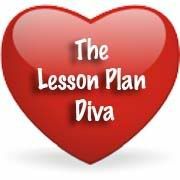 Plug-n-Plan: Facebook In Your Classroom? 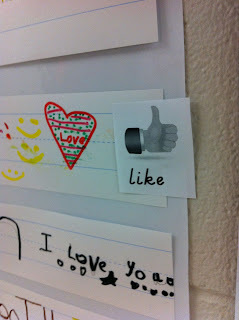 About a month ago I got this idea to bring Facebook into my classroom. Is that weird? Actually . . . it's just the idea of Facebook status updates that I wanted to bring in. I would have had this up sooner but the poster maker was out of paper at one point and then I got really busy with grades and all sorts of other deadlines! Anyhow, I decided to create "classbook"! I got so excited about the idea that I launched right into creating a logo for it before I realized that I wouldn't even need a logo for the format of the page I was setting out to create! I know 1st graders are pretty young, and if any of my kids were actually on Facebook I'd probably think it was a bad idea. However, I figured most of my kids would already know what Facebook was through either their parents or older siblings. A quick survey before launching into the lesson proved I was right! What I did was create a template that looks like a status update page so that I could make it into poster size for the hallway. I took a picture of each student and let them smile, pose, or act goofy. They were hilarious! Next came the part I was a little worried about . . . would they be able to understand what a status update is? I took a screen shot of my facebook page using some "safe" examples of status updates and projected it onto my mimio board. On one status a friend posted a quote which I explained was just something the person read somewhere and liked so they decided to share it. The next status was of a friend's thoughts regarding how the sound of a baby's giggle makes her smile. The last status was a message a friend posted thanking her friends for all the birthday wishes on her facebook page. 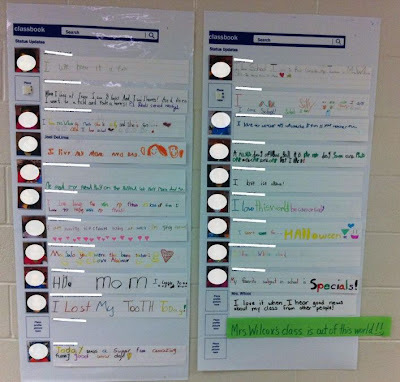 Then I gave them a sentence strip cut to the width of the poster I had made with the school poster machine and set them loose to write their "classbook" status updates. I was pleasantly surprised! 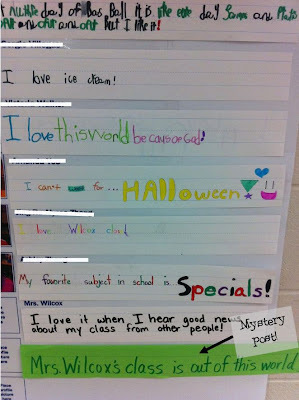 You would not believe how excited and into this "status update" thing my 1st grades are! This is great considering my condition for updating statuses - you can only update your status if you are finished with all your work including your unfinished work! I'm not sure about your kids, but a handful of mine have a hard time getting all their work done in time and begin to accumulate unfinished work. This has turned into a great motivator for my kids since they all want to update their statuses. I leave a stack of sentence strips trimmed to our poster size clipped with magnetic clips next to my door. They are free to take one to change their statuses when they have satisfied my requirements. 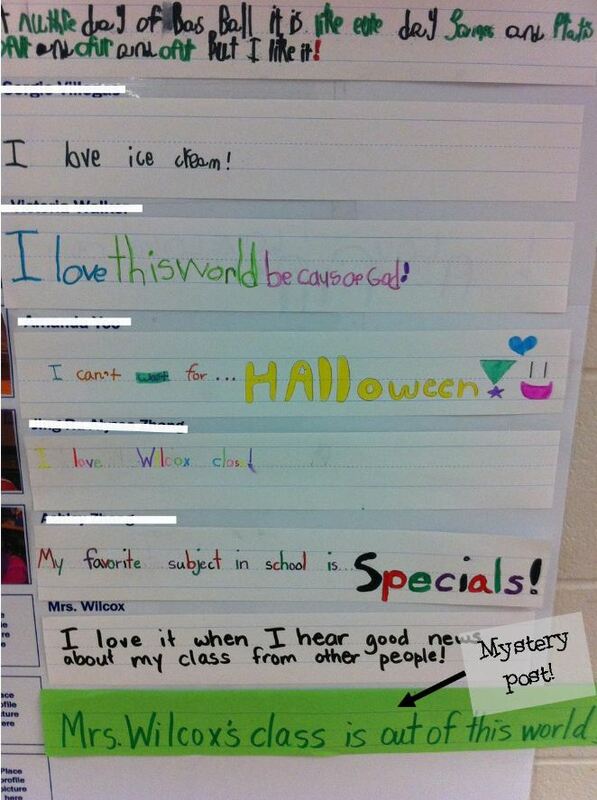 I have had a lot of teachers stop by (including one of my APs) to tell me how they enjoy the classbook page. We also notice how not only our class, but every other class passing by wants to stop and read the statuses . . . even if they are rushing off to lunch or specials! When we came back from recess, a new mystery post appeared . 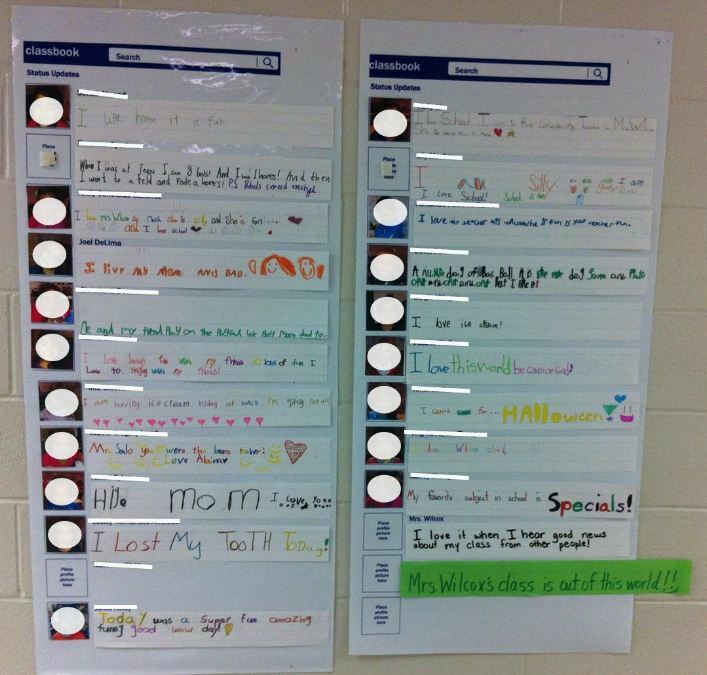 . .
One student's status declared her Kindergarten the best teacher. 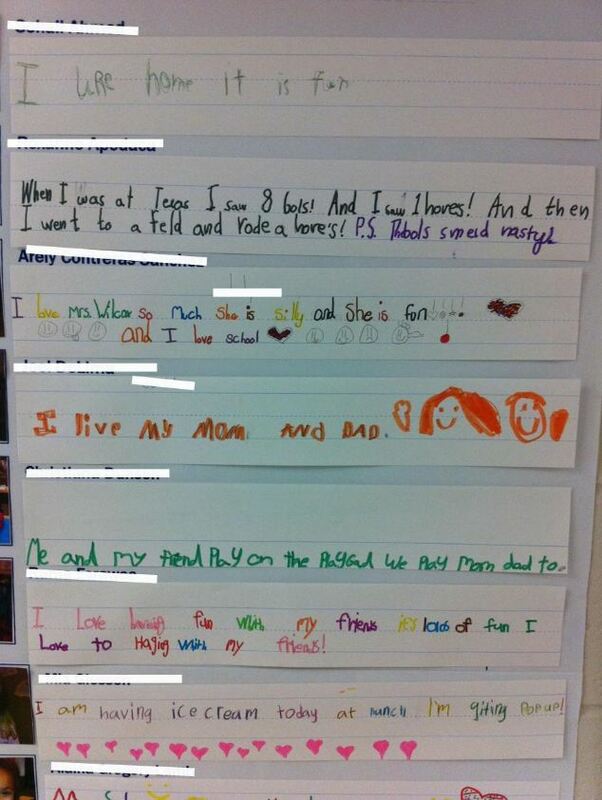 So what would any good Kindergarten teacher reading this about herself do? Why she'd create a like, button of course! 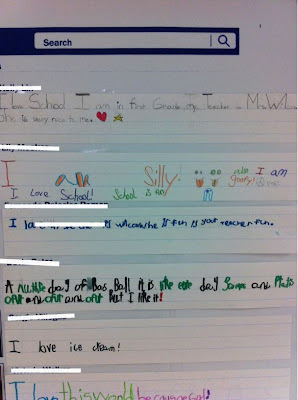 It's so fun and gets the kids engaged in writing and expressing themselves! AND it's a FREEBIE! I'm posting the files here for you to download if you'd like to give it a try. I went ahead and typed my students names in while it was still in a Publisher format, but I also have the PDF file available to preserve the font if you'd like to enter student names another way. The font used was Franklin Gothic Medium. I think this ongoing activity would be great for any grade level. I actually originally thought it'd be great for 5th graders since some of them are actually already on Facebook, but my kids really love it. I plan to keep it up all year and let them change their statuses as they choose. My 2nd grade teacher friend shared the idea at a teacher leader meeting in our county and the Kindergarten teachers were the ones going wild over it. Whatever your grade, give it a try . . . hope you and your kids enjoy! This is fantastic!!! Thank you for sharing! 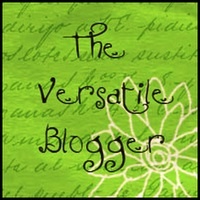 I have to say... this is my all time favorite idea from blogging! I have seen it since you posted it.. and I tell everyone about it! It's a wonderful idea!!! !Hope I will have time to bring it into life! I'm a teacher in the UK. I can't wait to try this out with my class of 5 and 6 year olds after our Christmas break. It's such a lovely idea and I can see it helping to develop their writing and also their social skills and bonding as a class. Thanks so much for sharing. I am an ESOL teacher and this is a fantastic lesson plan for teaching students how to interact (pragmatics) on the computer. This is good for middle grades, too. I could also be used as a "ticket out the door." Thanks! 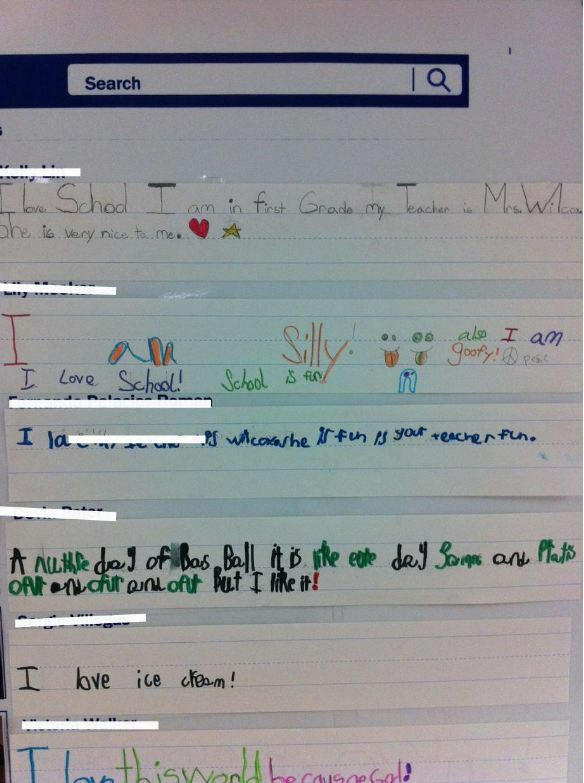 OMG I'm a Kinder/ Year 1 teacher in Australia and I LOVE this idea. I can't wait to try this out with my new class in Feb - Thankyou for sharing your great idea!!!!!!!!!!! Cristy - So glad you can use the idea. That's one of the best things about blogging and sharing ideas online . . . other people I normally wouldn't get to meet get to use the same ideas and activities! I love that! It's a good idea - I've used something similar with ESL teenagers before and integrated it with "Friend Requests" introduction exercise on the first day. Every student had to find out and swap personal information with one another. it served as a good getting to know you and was in keeping with the facebook theme. The status updates are also pretty awesome as a routine breaker and feedback gathering exercise - in that you can find out what they really think of the class! This is so creative! I can't wait to use this. Thank you so much for sharing. Love, love, love this.... Going to makes this a hallway display and update every Monday. Thanks for the awesome idea. My 4th graders are going to go crazy over this idea!! Love this idea!!! Definitely going to use it in September! By the way what is the name of the font you are using to write your blog? 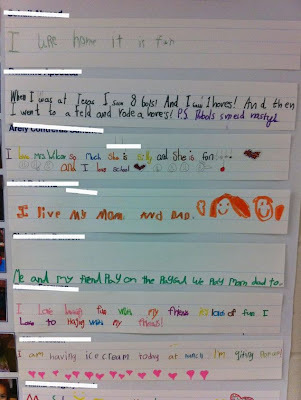 How do your kids stick their statuses to the posters? I use the poster maker at school to blow the Classbook pages up really big. Then I trim sentence strips to match the width of the posters (which means taking off about 3 inches). We just use masking tape or scotch tape on the backs to stick them on the posters (my posters re laminated so they peel of easy). Double sided tape works well too! this is such a fun, fantastic idea! thanks for sharing and having free pdf downloads! I love this idea. I am going to use this. I think I will laminate the sntance strip with the picture on it. 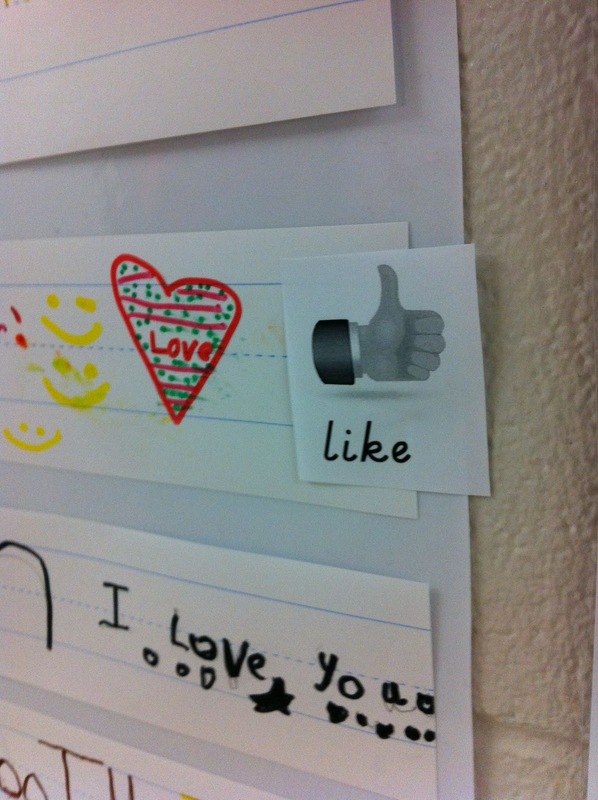 The students can use dry erase markers and hang their post in a pocket chart. Thanks so much. I love it. That's a brilliant idea! I'd save so many sentence strips that way! I have dry erase sentence strips that I had been saving for something . . . and this is it! =) Walmart had packs of dry erase sentence strips during the back to school sales for $.88 (I think). I stocked up then too! That way I can put velcro on the back, and they can peel it off and stick it back on when they are done with their new posts! Thanks for helping me improve Classbook! I was wondering what pocket charts you are using for this. They are a nice size and would like to purchase for this activity in my classroom. Welcome! I'm Melissa! I'm here to share my love for God through my love of the written word. Thanks for joining me here because between being a wife, mom, teacher, friend, and whatever other title you wanna throw in there . . . you'll never know what life stirs up! Great Finds On These Blogs! Come check it out!! These are amazing! 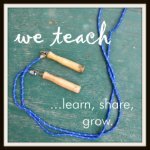 I am a teacher of a functioning classroom-2nd week in! Check out these sites . . .